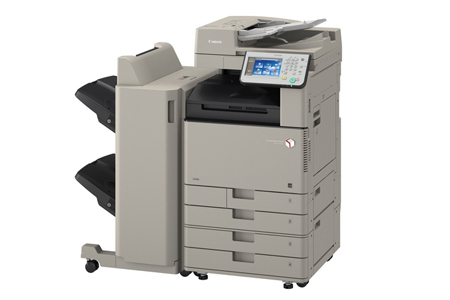 Canon have launched the imageRUNNER Advance C3320, C3320i, C3325i and C3330i (running at 20, 25 and 30 pages per minute respectively onto A4 or letter, at the same speeds in color as for monochrome). Built around a brand new print engine, the new machines also differ from their predecessors - the ir Advance C2220L, C2220i, C2225i, C2230i - by the presence of a new high-resolution touch screen. This is adjustable (as was the screen on the previous generation), which proves an asset to eliminate unwanted reflections or to improve accessibility for people in wheelchairs. The toner cartridges' capacity - usually a strength of Canon machines - again differentiates the new machines compared to the competition. In terms of software solutions, the integration of the WEB MEAP platform provides compatibility with most Canon solutions (uniFLOW, Therefore, imageRUNNER ADVANCE Desktop, Cloud Portal ADVANCE etc.) or those of third-party developers for applications related to document security (user authentication for copying or scanning, secure printing on demand), management (integration of scanned documents into electronic document management software or business applications) or cost control (print management solutions). For customers not yet convinced of the benefits of investing in these additional solutions, the Canon iR Advance 3300 series already features a number of native features able to cover a large proportion of small and micro businesses' needs, such as scan to PDF text or Open Offcie XML (the format used by Microsoft in its Office suite). Users can choose to scan to Word or to PowerPoint: an effective way to provide a paper processing solution without the need for external software. We could not conclude this news without mentioning the fact that this model offers stapling without staples (four sheets). This is a first for the manufacturer, which joins Ricoh in the list of manufacturers able to offer it. Find these products in Your DMO.